can play with their siblings. When I owned Newbury Nannies (which was the local leading nanny agency for over 25 years until it closed in 2011) many parents told me that they would like to use a nursery for their children’s social and educational development, yet were reluctant to do so due to the institutional aspect of some nurseries. Therefore, my dream was to create a nursery that REALLY is a home with plenty of character, as well as land and space for the children to play in – my dream came true at Acres of Fun! The wonderful house is set amidst a couple of acres of fabulous grounds. 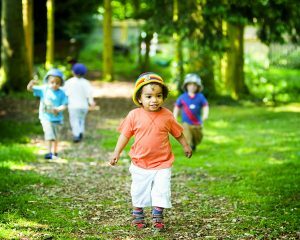 There are huge lawns, mature woodland, a vegetable garden and leafy glades – perfect for exploring, playing and building dens. I only employ quality staff at Acres of Fun. 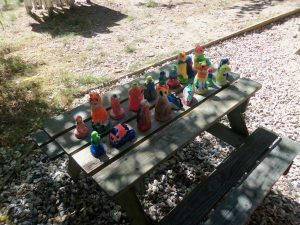 It is obvious how the staff love the children and their jobs – this is regularly commented on by visitors. The team are a terrific bunch who get on extremely well. Acres of Fun is always filled with lots of laughter! Happy staff means happy children! I employ more staff than the legal requirement – as I think this is essential in order to give quality care. These extra staff mean that periods of staff holidays and sickness are covered by staff with whom the children are familiar. I have NEVER employed any agency staff to look after the children. There is a fantastic age-range across the staff (something I feel is very important and another major factor that influences our high quality childcare). Nearly all our full-time staff are either qualified or undergoing training. Some of our older staff are not qualified but have their own children which brings additional qualities and attributes to Acres. These staff members totally understand how parents feel when leaving their precious children in someone else’s care. 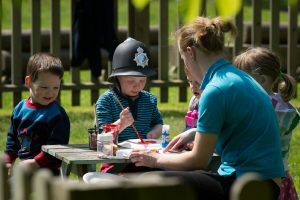 A member of staff is allocated to every family to support the children and parents; and keep them closely involved with their children’s experiences at Acres of Fun. I have a first-class management team lead by the Nursery Manager, Rebecca Pritchard, and Julie Huntley is the Senior Deputy Manager. They are supported by four more Deputy Managers. Rebecca joined the nursery as Head of Pre-School, and one of our Special Educational Needs Co-ordinators, in 2008. She quickly progressed to become one of our Deputy Managers and was appointed Manager in 2011. Julie has been at Acres since 2003 when the nursery first started! Our wide curriculum covers all the areas stipulated by OFSTED and a great deal more. A qualified Dance teacher visits Pre-School every week during term time, and we offer French and Music sessions in Pre-School too. Something is always happening in the Vegetable Garden throughout the year. We are either planting seeds, growing vegetables or harvesting crops with the children. Any produce is used in the Nursery kitchen. 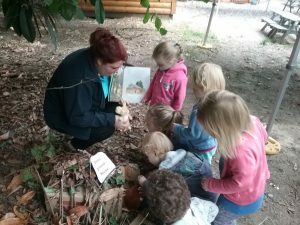 Children love to be busy outside in the garden – learning is such fun at Acres of Fun! The children really look forward to all these extra activities. The food at Acres is amazing! Our full-time Cook produces delicious and nutritious home-cooked meals, made with high quality ingredients. Lots of fruit and vegetables are incorporated into dishes so that even fussy eaters get their ‘five a day’ without realising! The Ofsted Report mentions the nutritious meals produced by our Cook, which contributed towards our ‘Outstanding’ award. Staff sit and eat with the children, encouraging good manners, good eating habits and good social skills at the table. Our Cook, and the kitchen, have been awarded the excellent, and sought after, 5* Food Hygiene rating by West Berkshire Council. When the time comes for your child to leave Acres of Fun and move onto school we want them to be confident, happy children with a sense of care and consideration for others. They will also have received an outstanding educational start, ready for the next stage in their young lives. Acres of Fun is all about children learning through play and having fun in a setting that is the next best place to home. We never forget that the children entrusted to our care are very young and must have fun. Acres of Fun offers exceptional childcare in exceptional surroundings.